Our Competition Spray Tan formula was created for ABC’s Dancing with the Stars for Spray Tan Sundays. It is designed to create the ideal set color for the professional dancers and celebrities. It can also be used for the demanding fitness models and body builders. The judges across the globe say it’s the perfect stage color! Can be used in any airbrush or HVLP tanning system. Recommended for: All skin types, fitness and/or bodybuilding competitions. Directions: Apply 1-2 oz. 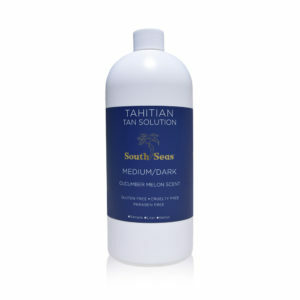 (50mL) of Tahitian Tan Solution the day/night before the event. Let the product develop for 8 hours and have the client shower. The next morning, apply 3-4 oz. (100mL) of Victory Competition Solution prior to the event. Shower after the event and moisturize daily thereafter. Aloe in de-mineralized water, Eco Cert Dihydroxyacetone (DHA), SD 40-2, Erythrulose, Alpha-Hydroxy Acid, Pro-Vitamin B-5, Cranberry Seed Extract, Ordenone, Propylene Glycol, Citric Acid, Copper, Caffeine, Phenoxyethanol, Potassium Sorbate, Fragrance, FD&C Red #33, Red #40, FD&C Yellow #2, Yellow #5, FD&C Blue #5, Blue #1.